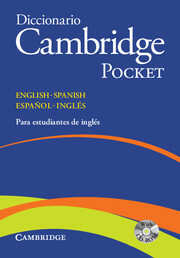 A Spanish-English bilingual dictionary specifically written to meet the needs of Spanish learners of English. Aimed at elementary to intermediate learners, this bilingual dictionary has been written to meet the needs of Spanish speakers learning English and includes over 61,000 words, phrases and examples and over 70,000 translations. It includes extensive notes highlighting the most common mistakes made by Hispanic learners (informed by the Cambridge Learner Corpus). Grammar boxes concentrate on the most difficult and problematic aspects of learning English. Includes the most useful and up-to-date vocabulary, based on frequency of usage information from the Cambridge International Corpus. Gives clear guidance to Spanish speakers on how to avoid typical mistakes - based on the Cambridge Learner Corpus (real student errors from Cambridge exam papers). Offers extensive coverage of Latin American and Peninsular Spanish, and British and American English. Specifically addresses the needs of Hispanic learners through conversation tips, phonetic transcriptions, pronunciation information, and grammar and usage notes. 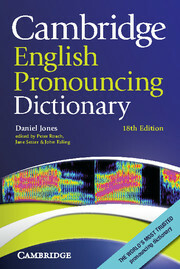 New edition of the classic work by Daniel Jones includes up-to-date entries and new study pages.